Canon is a leader in cameras and copiers and is the world’s largest maker of laser-printers and office machines. As of 2007, Canon was world’s largest maker of digital camera, with a 26 percent global market in share. Canon released its first digital camera, the Powershot 600, in 1996 and saw its sales take off in the early 2000s when it introduced the IXY model with its compact size and stylish design. The company sold its 100 millionth compact digital camera in August 2008, and sold 27.9 million units in fiscal 2007-2008. Canon made a group net profit of about $240 million and a group operating profit of about $900 million in fiscal 2010-2011 on sales of $35 billion based on the recovery in the United States and increased sales in laser printers and digital cameras. Sales slowed in 2008 and 2009 due to the global economic downturns. Sales in 2010 are expected to be ¥3.75 trillion. In 2001, Canon had profits of $1.62 billion on sales of $25 billion. That year it controlled 30 percent of the copier business, producing portable machines that were almost as fast as large Xerox machines, and held 70 percent of the laser printer market including the machines it made for Hewlett-Packard. Canon placed 33rd in the 2011 Interbrand Best Global Brands ranking. Coca Cola and IBM were No. 1 and 2. Canon has 25 percent of its sales in Japan, 34 percent in the Americas, 29 percent on Europe and 12 percent elsewhere. Almost 48 percent of its sales are in computer peripherals, namely printers, 24 percent is in copying machines, 19 percent in cameras, 5.8 percent in optical products and 4.7 percent in business systems. $7000 Canon digitcal camera Canon reported profits every quarter in 2003, 2004 and 2005. It reported its 8th straight year of record profits in fiscal 2006-2007 thanks largely to high demand for it high margin digital single lens reflex cameras and copiers. Net income rose 8.7 percent from the previous year to ¥495 billion. Canon’s profits were ¥98 billion in fiscal 2008-2009 during the global financial crisis. The company cut 1,100 workers at its subsidiaries in Oita and delayed the opening a new digital camera plant in Nagasaki. Canon is one’s world’s biggest maker of photocopiers, printers, scanners and fax machines. 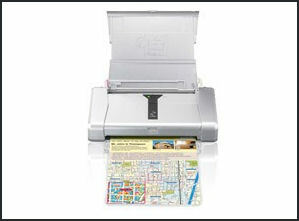 It makes good profits from color laser printers and expensive digital cameras, devices which have high profit margins. Canon depends on overseas sales for 80 percent of its income. In the camera business, Canon made more money for filmmakers than it did for itself. In copying machines and digital cameras it has not repeated the mistake. It makes large profits selling pricey toner and ink cartridges for copiers and printers that sell for relatively low prices. Canon also supplies the ink cartridges for printers made by other companies and has toner and cartridge factory in the United States. Canon executives put a lot emphasis on cash flow and extracting profits from economies of scale. photo inkjet printer Under CEO Fujio Mitari, who took over the job in 1995, Canon had been very profitable. In 2003 it surpassed Sony in market value. Things began to take off for the company in 1998 when it stopped making personal computers and typewriters and focused on digital cameras, copiers, printers, and chipmaking equipment. Mitarai transformed Canon from a company that made mostly cameras into one that became a leading manufacturer or copy machines and computer peripherals. Before he became Cannon CEO he served for 23 years as head of Canon USA. In March 2006, Mitarai became the head of Keidanren, the powerful business organization. He is the first executive from the information technology industry to lead the organization. Mitarau slipped some was when a friend of his, Norihasa Oga, an executive at a construction, was arrested for tax evasion in connection construction of a Cannon factory for Canon in Oita Prefecture and was accused of his ties with Mitaru to win contracts, commissions and concessions, worth millions of dollars. In January 2005, Canon announced it would get rid of its seniority system entirely and reward employees with a merit-based wage system. The system was introduced in 2001 for high level management positions with pay based on job difficulty determined by their authority to make deals and the number of subordinates working under them. In September 2004, Canon announced it was going to build a $229 million R&D center in Tokyo. At that time Canon was spending $2 billion a year on research and development. It ranked No. 2 in patents received in the United States and made $200 million a year from patent royalties. Canon is putting a lot of resources into the flat-screen television market. It also makes advanced third generation rear projection and next-generation organic electro luminescence (OEL) displays. Panasonic, Hitachi and Canon have formed an alliance to develop and produce this technology. The alliance was formed to defray some of the high costs associated with flat panel technology and develop the technology for use in digital cameras, cell phones and other media as well as televisions. In July 2008, Canon announced that would spend ¥17.4 billion to build a new factory in Nagasaki Prefecture that can produce 4 million digital cameras a year. Originally Daily Yomiuri Daily Yomiuri Expected to being production in December 2009, it will be Cannon’s third digital camera factory in Japan. The opening was delayed due to the global financial crisis in 2008 and 2009. Canon has won much praise for its D90 camera, which combines a world-class, single-lens-reflex camera and a video camera that shoots in high definition. The camera cost $999, and $1,299 with a lens. In September 2006, Canon recalled 800,000 desktop copiers because of a problem with a improperly fitted electrical connection that in rare cases caused the machine to overheat, emit smoke and catch a fire. During the economic crisis in 2008 and 2009, Canon made profits but they were lower than before. Canon is a leader in digital cameo technology that allows cameras to instantly analyze the brightness of surrounding conditions of target objects before setting the proper aperture and shutter speed. In 2010, Canon it would enter the robotics industry and begin marketing industrial robots by 2015. It made the decision based in what it sees as strong growth in the robotics sector. It is targeting robots for health care and emergency situations using image recognition and information processing technology it developed for digital cameras and other products. Sharp headquarters Sharp is an Osaka-based company credited with starting the calculator revolution. It is currently a leader in flat-screen televisions and solar energy. It is Japan’s largest producer of liquid-crystal display (LCD) televisions---making LCDs not only for itself but also for Sony, Toshiba and others--- and for long time was the only Japanese company to make profits in LCDs. It made large profits in the mid 2000s. 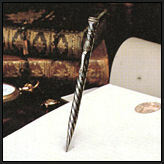 Sharp was founded in 1912 by Tokuji Hayakawa, who invented a mechanical pencil called the “Ever Sharp” in 1915. Such pencils are still called “sharp pencils” in Japanese today. The company produced Japan’s first commercial TVs. Sharp engineers applied LCD technology to word processors and other devices but initially when they applied it to television it only produced grainy images. Over the years researchers tried many different substances in conjunction with liquid crystal. Finally in 1983, a group of scientists that included Funada developed an amorphous hpis compound that produced clear television images on a three inch screen. The search was then focused on material that could be used for larger screens. Early attempts resulted in a few success and lots of defects. 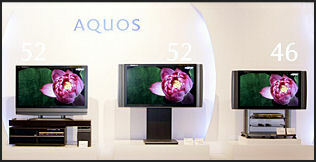 The first Aquos LCD televisions went in sale in 2001. Sharp made a group net profit of about $240 million on a group operating profit of about $900 million in fiscal 2010-2011 on sales of $35 billion. The net profit was a 4.4-fold increase from the previous year on the back of strong sales of flat-screen televisions and other home appliances. Sharp was back in the black in fiscal 2009. Sharp had a $450 million loss in fiscal year 2006 and cut 2,300 jobs as the sale of digital cameras and mobile phones slumped. In fiscal 2007 it made a net profit of $1 billion and an operating profit of $1.83 billion. Sharp lost $1.26 billion fiscal 2008 in the midst of the global financial crisis. Hard hit by decline in flat-screen television and cell phones, it closed two LCD production lines. 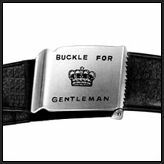 1912 belt buckle Sharp makes televisions, DVD players, cell phones, refrigerators, microwave ovens, personal computer, image sensors, cameras, flash memory chips and other stuff. 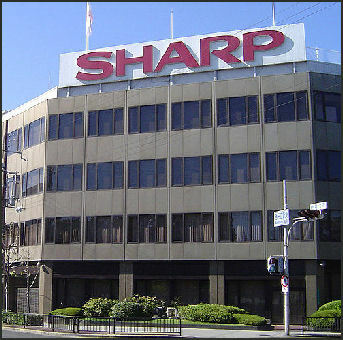 Sharp is a leader in making cell phone hand sets in Japan. The company aims to sell 5 million smart phones annually to take a 30 percent share in the domestic market by 2013. In 2010, Sharp launched the Galapagos e-book device to compete with Apple’s I-pad. Initially the 10.8-inch version sold for ¥ 54,800 and the 5.5-inch version for ¥39,000. In September 2011 Sharp stopped selling two of its Galapagos tablets 10 months afer they were introduced as didn’t sell because customers preferred smartphones. In April 2010, Sharp unveiled an LCD display touchscreen that shows 3-D images without requiring special glasses. The display is expected to be used in 3-D Nintendo DS consoles launched in 2011. Sharp also said it would launch 3-D LCD televisions in the summer of 2010. They use four primary colors instead of three to boost the brightness of the pop-out images. Ever Sharp pencil Sharp is the second largest solar cell producer in the world after German’s Q-Cells AG. It produced 2.07 million kilowatts worth of cells in 2007. Sharp and Italy’s largest utility company, Enel Sp. formed a joint venture to make solar panels and plan to invest $1 billion in the venture between 2009 and 2012. In March 2012 it was announced that Foxconn Technology Group and founder Terry Gou, would invest $1.6 billion in Sharp. Bloomberg reported: “Foxconn, including Taipei-listed flagship Hon Hai Precision Industry Co., will buy 9.9 percent of Sharp for 66.9 billion yen in a new-share sale. Foxconn Chairman Gou and related investment companies will buy 46.5 percent of Sharp Display Products Corp., a venture with Sony Corp., for 66 billion yen. “Sharp intends to increase its operating rate and reduce costs through the joint management of the plant with Hon Hai. Kazuharu Miura, senior analyst at SMBC Nikko Securities Inc., said the alliance means "large home appliance manufacturers that have undertaken vertical integration have been defeated [by an overseas company]. These domestic businesses should view Sharp's actions as an opportunity to review their strategy and compete during the next 10 years." In June 2009, some of Sharp’s televisions and computer monitors were banned in the United States for fringing on a patent owned by Samsung. Earlier a trade judge said that some Samsung televisions and computer monitors should be banned because they infringed on Sharp patents. Sharp has a 12 percent share of the global LCD market, forth behind Sony, Samsung and Phillips Electronics. Sharp has 40 percent of Japan’s LCD television market, impressive considering the amount competition in the market. Sharp sold 6 million LCD televisions in fiscal 2006. Flat screen market share in North America in early 2008: 1) Samsung (21.9 percent); 2) Sony (17.3 percent); 3) Vizio (8.8 percent); 4) LG Electronics (8.3 percent); 5) Sharp (7.9 percent); 6) Matsushita (6.4 percent); 7) Toshiba (5.4 percent); Others (24 percent). Sharp is focusing on building profitable-very large-screen, flat-panel televisions. As of January 2007, Sharp produced the largest flat screen television: 108-inch liquid crystal display. The record before was 102 inch model made by Samsung. Sharp unveiled a 52-inch flat-screen prototype that is only two centimeters thick in October 2007. It unveiled a 29-millimeter-thick television in August 2008 that was touted as the thinnest, lightest and lowest energy-consuming liquid crystal display in the world. Sharp and Panasonic have emerged as the two main players in the flat screen business in Japan but there are worries that their massive investments when the global economy is melting down will backfire in them Sharp has LCD plants in Japan, Poland and Mexico. In January 2007, it announced plans to invest $2 billion to triple its LCD and phone output. In December 2007, Sharp began construction of world’s largest LCD plant in Sakai, Osaka Prefecture to produce LCD panels for flat screen televisions. It is expected to be completed in March 2010. The new plant in Sakai will cover 1.27 million square meters---enough to accommodate 33 large stadiums---and will embrace plants for solar panels and parts. It’s main purpose will be to manufactures LCD panels mainly for 40-inch and 60-inch model televisions by cutting glass substrates in sheets the size of five doors or tatami mats. The larger a glass substrate is the easier it is to produce large screen televisions at a lower cost. Going at full capacity the factory will be able to produce 13 million 42-inch panels annually. More than half are likely to be sold to other firms. At the Sakai plant, two thirds of production will go to Sharp and the remainder will go to Sony. Sharp has an alliance with Toshiba and Sony to produce to 30-inch and 60-inch LCD panels to use in their flat screen televisions. The alliances increase Sharp’s growth and power in the LCD market and cut costs for Sony and Toshiba. In December 2010, Sharp and Japan’s LCD production was given a nasty blow when Sony said it would not purchase LCD panels from Sharp or invest in Sharps LCD factory in Sakai. Instead, Sony said, it would purchase LCD screen from Taiwanese manufacturers. Sony said it is holding back on investing in Sharp’s LCD screen factory over concerns that the high value of the yen makes Japan-made LCD screens too expensive compared to those produced in other countries. The Sakai factory utilizes “10th-generation” technology, which is especially well-suited to making large screens. Sharp is opening a LCD plant in Nanjing in China. The plan was use older “eighth generation” technology there. The Chinese have demanded that 10th generation technology be used at the Nanjing plant or else it won’t be allowed to open. Sharp solar cells Sharp is world’s largest maker of solar battery systems. It produces 4 million kW a year. In July 2006, Sharp introduced solar panels that it said were twice as effective as solar panels produced before that time. Much of the success is die to the ability of the panels to change their angles during the day and over the course of a year to get the optimal amount of light from the sun. The system has an power-generating efficiency of 36 percent compared to 15 and 20 percent for previous systems. Kansai Eclectic Power Company and Sharp plan to build one of the world’s largest solar power plants near Osaka to provide power for homes and factories. The plant is expected to produce 28 megawatts, enough to provide electricity of about 8,000 households. The plant will be built on a 20 hectare site. Construction is planned to begin in 2009. In 1959 Sharp founder Tokuji Hayakawa, proposed making a solar battery which he called “the next big technological breakthrough after television.” One of the first major applications of Sharp solar technology was on lighted buoys at sea that previously used oil or gas and needed to periodically be refilled, a costly process. In 1976, Sharp introduced the first solar-powered calculators. Sharp plans to raise its output of thin film solar cells. There are two kinds of solar cells: thin-film and crystalline silicon cells. The former can be made with 99 percent less silicon. These days there is a worldwide silicon shortage, and prices for the material are high. Sharp also produces lithium ion batteries for solar systems that can store electricity in the day for use at night. Sharp is active in providing solar technology to developing countries such as Mongolia, where generating electricity by other means in remote areas is very expensive. In developed countries like Germany it has been active in turning unproductive wheat farms into solar farms by placing solar panels on land formally occupied by crops. 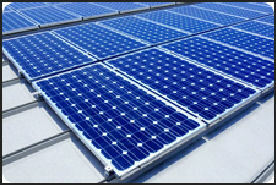 In the Napa Valley in California solar cells have been floated on an idle pond to produce electricity for a winery. Today Sharp solar panels can be found in the CIS Tower in Manchester, England, where 7200 modules produce 183,000 kW a year; the Salzberg Airport in Austria; and the Bruchwegstadion in Mainz Germany. The new Sharp LCD plant in Sakai is not only produced thin films for LCDs it will also make thin films for solar cells covering the plant’s roof.